A self balancing accounts system is one in which a separate trial balance can be extracted from all ledgers including the general ledger and each of the other subsidiary ledgers maintained by the business. A small accounting system with few transactions can usually be maintained in a single ledger. As the business expands the number of transactions increases and multiple subsidiary ledgers are used. When operating a multi-ledger system a decision needs to be made as to whether to use a sectional accounting system or as mentioned above a self balancing accounts system. 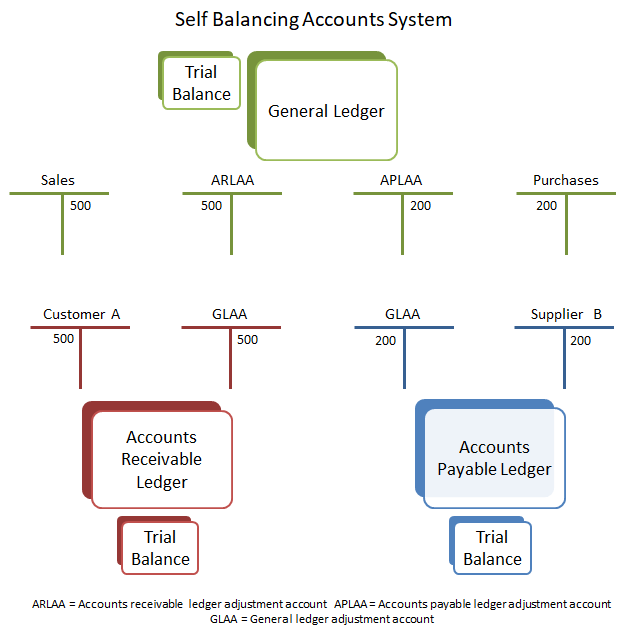 A sectional balancing accounting system is one in which the general ledger maintains a control account for each of the other subsidiary ledgers. Each transaction in the subsidiary ledger is one sided and for information purposes only. The subsidiary ledgers are not part of the double entry system and the trial balance is only extracted from the general ledger which includes the control accounts. Since only a section of the ledgers (usually the general ledger) is balanced the system is referred to as a sectional accounting system. The self balancing accounts system is one in which the each subsidiary ledger is part of the double entry system. Each transaction in a subsidiary ledger has a two sided entry and a trial balance can be extracted from each ledger. Since each ledger has to be in balance the system is referred to as a self balancing accounts system. By way of example consider an accounting system with three ledgers, the general ledger, accounts receivable ledger and the accounts payable ledger. In the self balancing accounts system each transaction in a ledger requires a debit and a credit entry. In order to allow for this two sided entry each ledger has an adjustment account with the general ledger and vice versa. In this example four adjustment accounts are opened two in the general ledger and one in each of the accounts receivable and accounts payable ledgers. General Ledger: Two accounts are opened in the general ledger the accounts receivable ledger adjustment account and the accounts payable ledger adjustment account. The accounts are sometimes referred to as the debtors ledger adjustment account and the creditors ledger adjustment accounts respectively. Accounts Receivable Ledger: A general ledger adjustment account is opened in the accounts receivable ledger. The accounts receivable ledger now contains the usual individual customer personal accounts and this additional general ledger adjustment account to which the two sided accounting entries are posted. Accounts Payable Ledger: A general ledger adjustment account is opened in the accounts payable ledger. The accounts payable ledger now contains the usual individual supplier personal accounts and this additional general ledger adjustment account to which the two sided accounting entries are posted. To see how each of the ledgers self balances it is easiest to look at two typical sale and purchase transactions one in the accounts receivable ledger and the other in the accounts payable ledger. The business sells goods on credit terms to Customer A for the amount of 500. Using the general ledger adjustment account (GLAA) the business makes the following two sided entry in the accounts receivable ledger. The debit entry to the customer account reflects as usual the amount owed to the business in respect of the on account sale. In a self balancing accounts system a corresponding credit entry is now made to the general ledger adjustment account in order to balance the accounts receivable ledger. Similar entries can be made in respect of other items such as cash received and sales returns. In each case the usual accounts receivable entry is made to the accounts receivable ledger and an equal and opposite entry is made to the general ledger adjustment account. The table below summarizes the entry made in the general ledger adjustment account for typical accounts receivable transactions. As two sided entries have now been made in the accounts receivable ledger, at the end of the accounting period a trial balance can be extracted to show that the ledger is self balancing. The general ledger is now used to complete the posting of the sales transaction. Using the accounts receivable ledger adjustment account (ARLAA) the business makes the following two sided entry in the general ledger. In the general ledger the credit entry is made as usual to the sales account either as an individual transaction or as part of a monthly total. In order to self balance the general ledger a corresponding debit entry is made to the accounts receivable ledger adjustment account. It should be noted that at the end of the period the general ledger adjustment account and the accounts receivable ledger adjustment account should have equal and opposite balances. The business purchases goods on credit terms from Supplier B for the amount of 200. Using the general ledger adjustment account (GLAA) the business makes the following two sided entry in the accounts payable ledger. The credit entry to the supplier account reflects as usual the amount owed to the supplier in respect of the on account purchase. In a self balancing accounts system a corresponding debit entry is now made to the general ledger adjustment account in order to balance the accounts payable ledger. Similar entries can be made in respect of other items such as cash paid and purchase returns. In each case the usual accounts payable entry is made to the accounts payable ledger and an equal and opposite entry is made to the general ledger adjustment account. The table below summarizes the entry made in the general ledger adjustment account for typical accounts payable transactions. As two sided entries have now been made in the accounts payable ledger, at the end of the accounting period a trial balance can be extracted to show that the ledger is self balancing. The general ledger is now used to complete the posting of the purchase transaction. Using the accounts payable ledger adjustment account (APLAA) the business makes the following two sided entry in the general ledger. In the general ledger the debit entry is made as usual to the purchases account either as an individual transaction or as part of a monthly total. In order to self balance the general ledger a corresponding credit entry is made to the accounts payable ledger adjustment account. It should be noted that at the end of the period the general ledger adjustment account and the accounts payable ledger adjustment account should have equal and opposite balances.